French director and artist Agnès Varda has died. She's seen here posing next to her installation "La serre du bonheur" at the Chaumont-sur-Loire castle on March 23. French film director Agnès Varda, who was a pioneer during the new-wave revolution of the 1950s and '60s and who kept making important films for the next five decades, has died at age 90. A representative of Varda's family confirmed the news of her death to NPR Friday. In a statement, her film company says the filmmaker and artist "died from a cancer at her home in the night of March 29, 2019, surrounded by her family and friends." As a director, Varda had a photographer's eye for capturing striking images — a skill she often used to accomplish the feat of allowing her stories to seem as if they told themselves. But behind the camera, a master was at work. "Literature had changed, painting had changed, culture. And from what I knew, the movie had been just illustrating stories, illustrating books," Varda said in 2015. "I could see that the feeling was just to illustrate, when I thought, 'It should be radical.' "
By making La Pointe Courte, historian Georges Sadoul said, Varda created "truly the first film of the nouvelle vague." La Pointe Courte tells the story of a Parisian couple visiting the husband's modest hometown, a small fishing village. As the relatively simple story unfolds, viewers can feel a guiding intelligence through Varda's meticulous staging and framing of shots. Shot in black and white, two main narratives emerge, much as in William Faulkner's The Wild Palms, Varda's inspiration for the film. "Varda's authorial control over both scriptwriting and directing, the exclusive use of location shooting, the mixing of professional and nonprofessional actors — all of this was groundbreaking in early 1950s France," Ginette Vincendeau wrote for Criterion in 2008. "Varda is sometimes referred to as the godmother of the French New Wave," Roger Ebert wrote about Varda in 2012. "I have been guilty of that myself. Nothing could be more unfair. Varda is its very soul, and only the fact that she is a woman, I fear, prevented her from being routinely included with Godard, Truffaut, Resnais, Chabrol, Rivette, Rohmer and for that matter her husband Jacques Demy." Over the years, appreciation for Varda's work has only grown. In 2017, she was awarded an honorary Oscar for lifetime achievement. That followed her Palme d'honneur, a lifetime award from the 2015 Cannes Film Festival. As she explored her art, Varda kept a steady eye on important social themes, particularly the role of women. And she frequently turned her lens onto revolutionary ideas, filming in Cuba in 1963 (for 1971's Salut les Cubains) and making a short documentary about the Black Panthers in 1968. "All life is about borders. Language borders, ethnic borders, etc.," Varda said in 2015. "And in the cinema, I tried to erase borders, or make them smooth: between documentary and fiction; black and white and color; cinema and art." Varda's well-respected films range over decades, from 1962's Cléo from 5 to 7 and 1965's Le Bonheur to 1985's Vagabond — the story of a young woman living alone, constantly on the move. 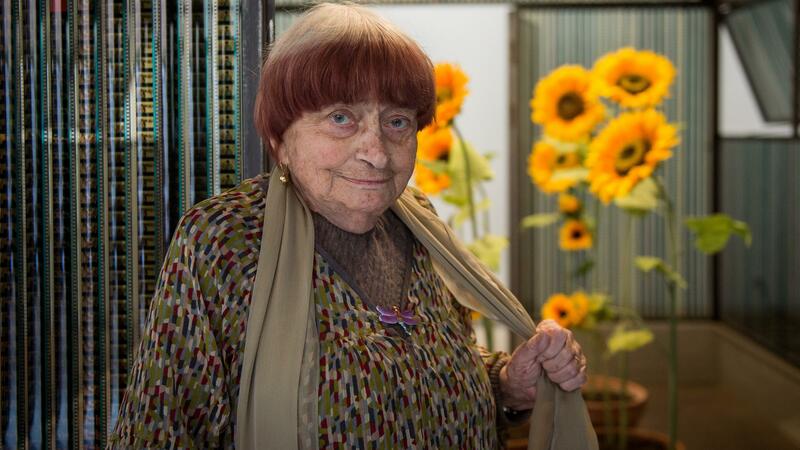 "We chose normal people that we met, I would say, people with no power," Varda told NPR. "That was the point. The thing was, can we be person-to-person, and can we put the meeting as the main action? Meeting, listening, enjoying to meet." Even in Varda's autobiographical film, she turned the camera on others. "Varda teaches us how to understand our lives," the critic John Powers said on NPR in 2009. "We start not with our inner feelings, but with the people and places that matter to us. That's why the film brims with generous portraits of the people who matter to her — the bakers next door, filmmaker Chris Marker, even her Hollywood pal Zalman King, the softcore impresario behind the cringeful Red Shoe Diaries." Powers concluded, "Looking back over the 55 years of Varda's film career, it's tempting to say that she's the most distinguished living woman filmmaker. But that would be to insult her with faint praise. She's one of the most distinguished filmmakers, period." NPR's Elizabeth Blair contributed to this report.